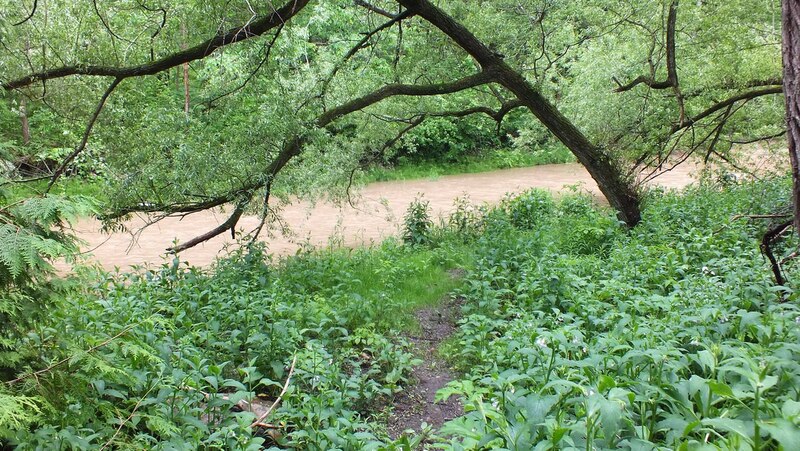 Recently, Bob and I took the opportunity of a break in the rain for a hike along the Seaton Hiking Trail, near Whitevale, Ontario. 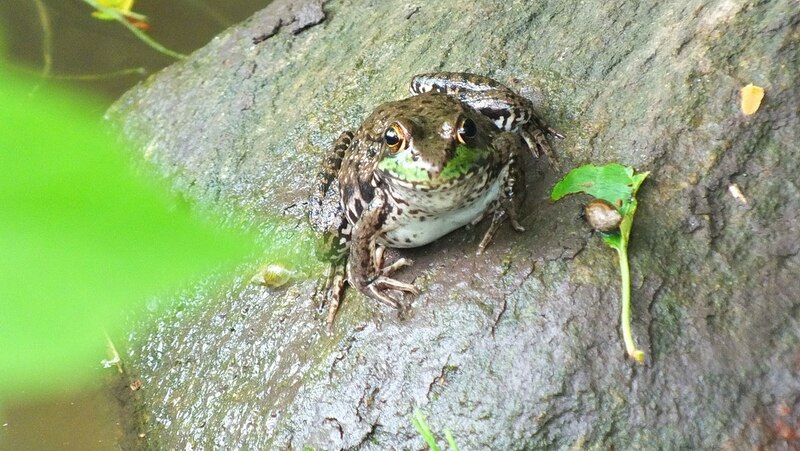 How apt that we spotted a Green Frog (Lithobates clamitans) resting at the side of the swiftly moving water on a damp rock. Now, you are probably thinking, “aren’t all frogs green?”, but the Green Frog is one of Ontario’s 13 recognized frog species. 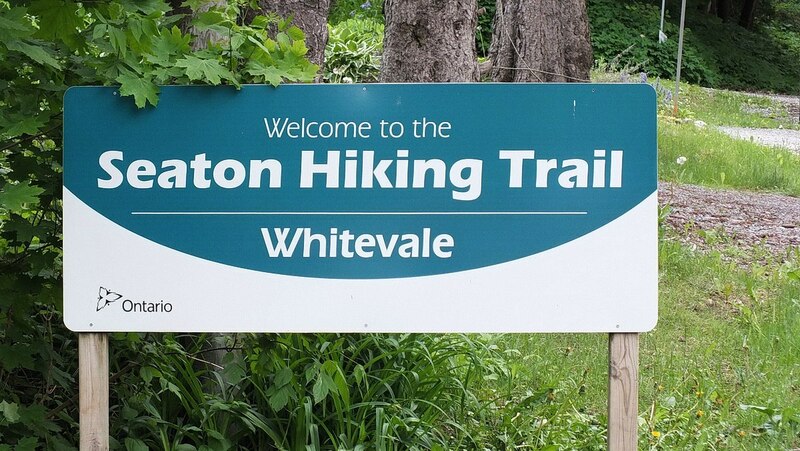 Bob and I usually set off on the Seaton Hiking Trail from the small community of Whitevale in Pickering. A sign marks the entrance to the trail, and parking is available next to a small park where the sign is found. 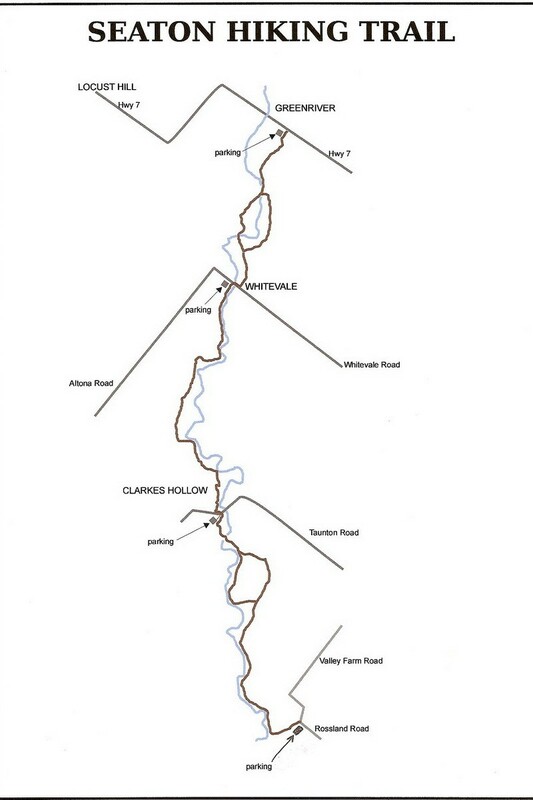 From Whitevale, hikers can elect to travel south or north along the Green River, and Bob and I have gone both directions many times over the course of the last 30 years. It is always delightful to see the changing face of the river and forest given the season and the weather. 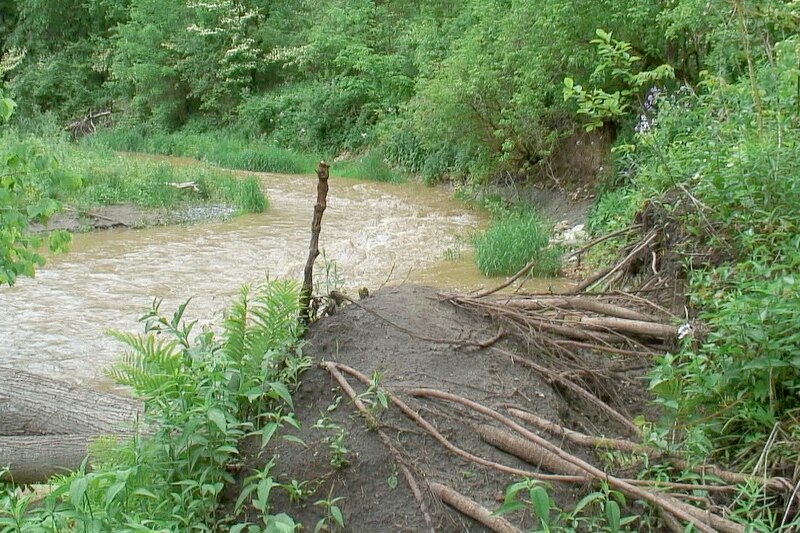 Given the wet weather that has beset Ontario this year, the water level in the Green River was once again very high, and in light of the rain over the previous few days, the water was running red with churned up mud. and as we explored the trails on the east side of the river, the sounds of gushing, flowing water drowned out most other sounds. 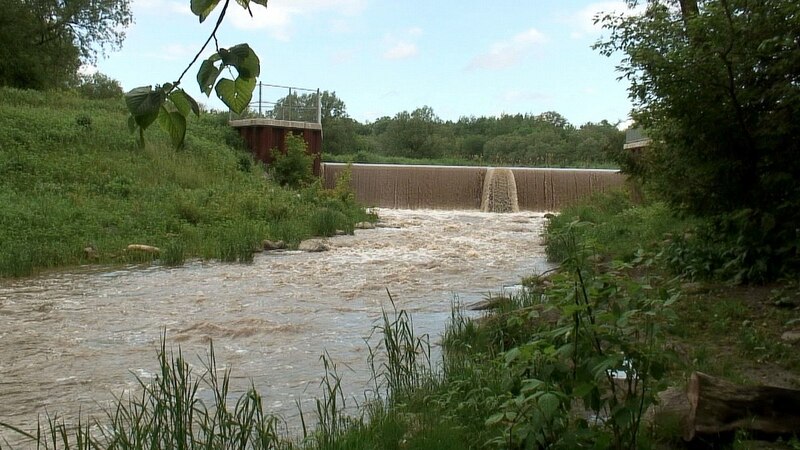 About 2/3 of the way north towards Highway 7 is a man-made dam that was built to control the flow of the river. 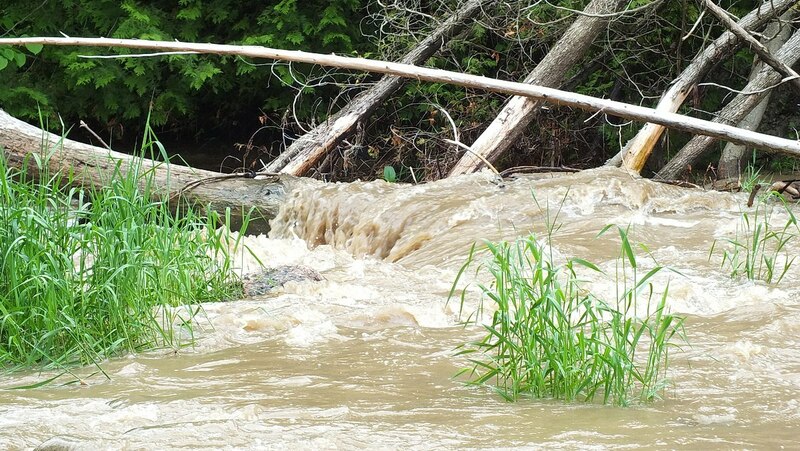 Normally, we would see salmon trying to jump the waterfalls, but we were a little too late in the season. 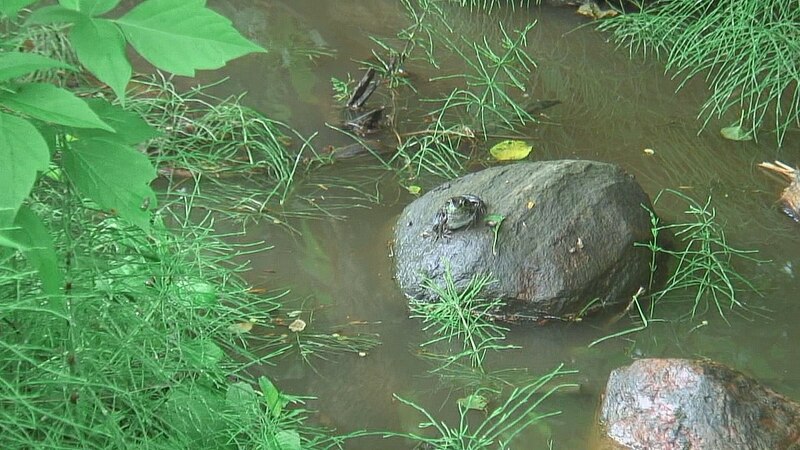 It was there, just below the dam, that a Green Frog sat resting on a big rock. 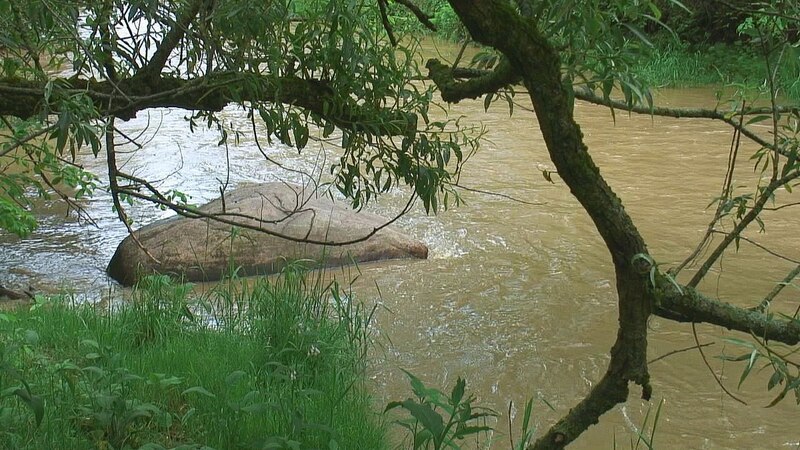 The river had overflowed its banks and left a small pool of water, a less risky spot to take a dip at the present time. I was careful to move slowly and keep partially hidden by vegetation so as not to scare the frog from its spot. Green Frogs can be recognized by the bright green patches above the upper lip. 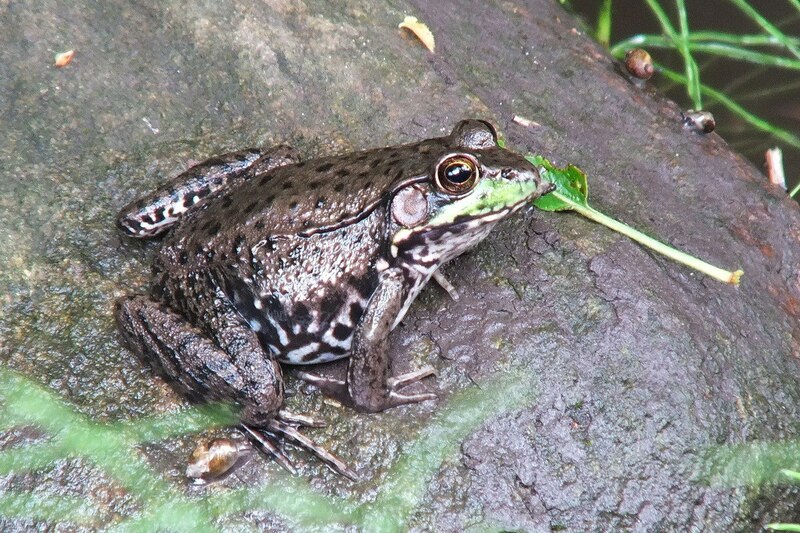 When I first sighted the frog through my camera lens, I thought it had a piece of vegetable matter sticking out of its mouth. Ha, ha. The joke was on me. 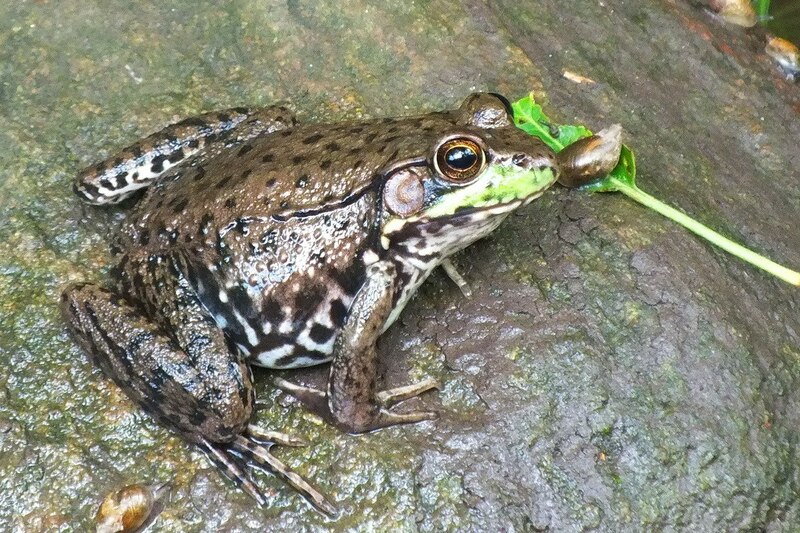 I was struck by the black mottled pattern on the frog’s sides, but actually, the black bands across its legs are a more effective way of determining the species. 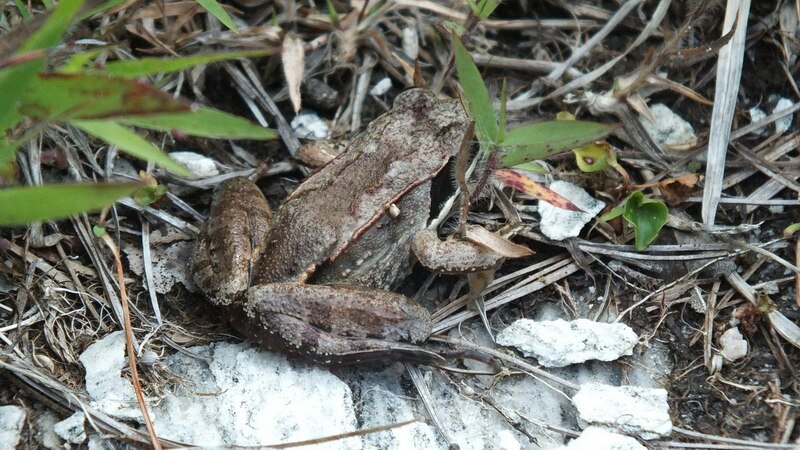 It is the ridges running down each side of the Green Frog’s back that distinguishes it from a bullfrog. Green Frogs may be found near any permanent source of water, but they do prefer slow-moving rivers. 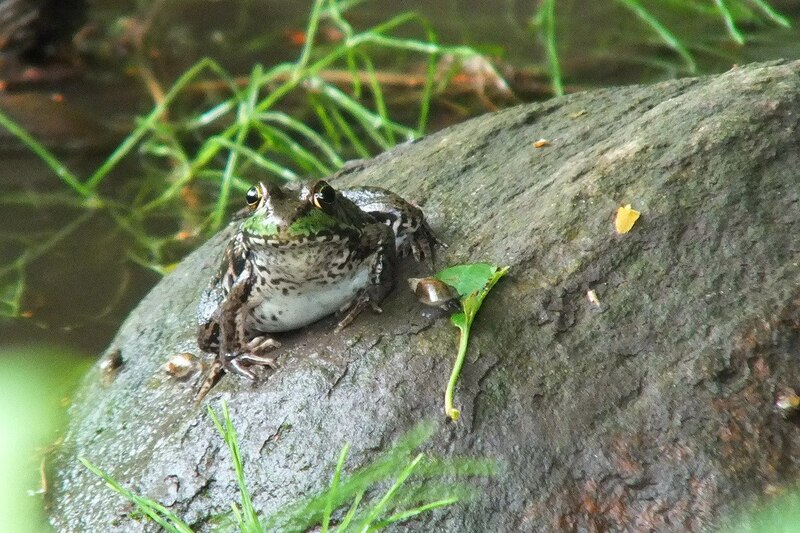 Maybe the temporary surge in the river’s current is what inspired this frog to wait it out on the sidelines. 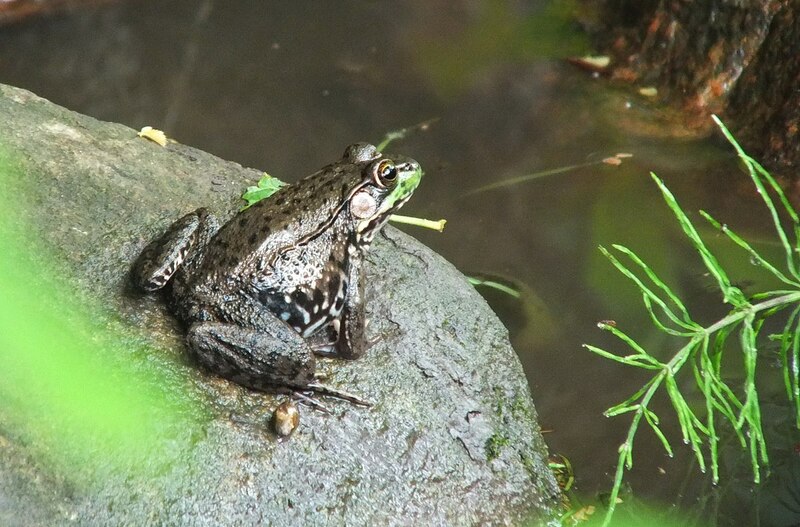 Male Green Frogs typically have a yellow throat during breeding season, which is in June and July. In the closeup frontal view of this frog, the throat had a faint yellow tinge to it which makes me think that it is a male that has not yet come into full breeding colour. We’ll never know as I am positive it will be long gone by the next time we walk along the river. The frog’s ever-watchful eye paid off as it snatched an insect from the air. The telltale sign is still sticking out of its mouth. 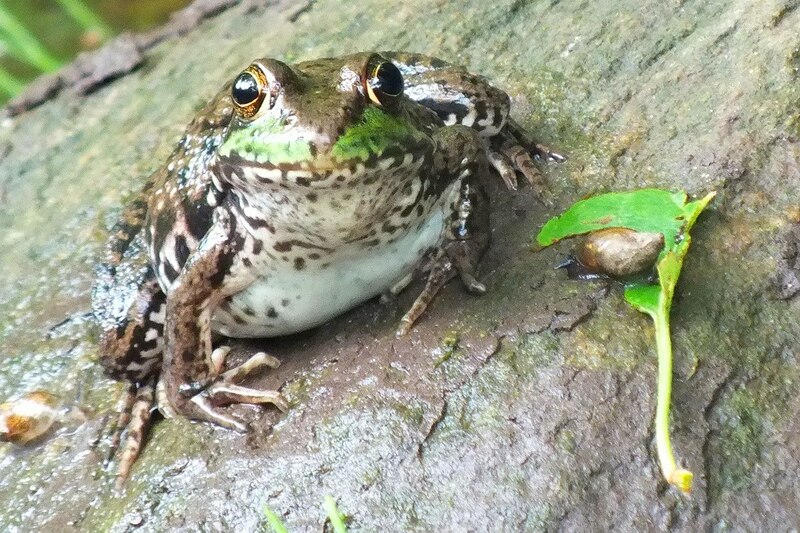 With all the damp cool weather in our area over the past couple of weeks, I am sure there will be lots of insects for this frog to eat. Who knows? By the next time Bob and I walk along the Green River, maybe we’ll be lucky enough to hear the call of the Green Frog. 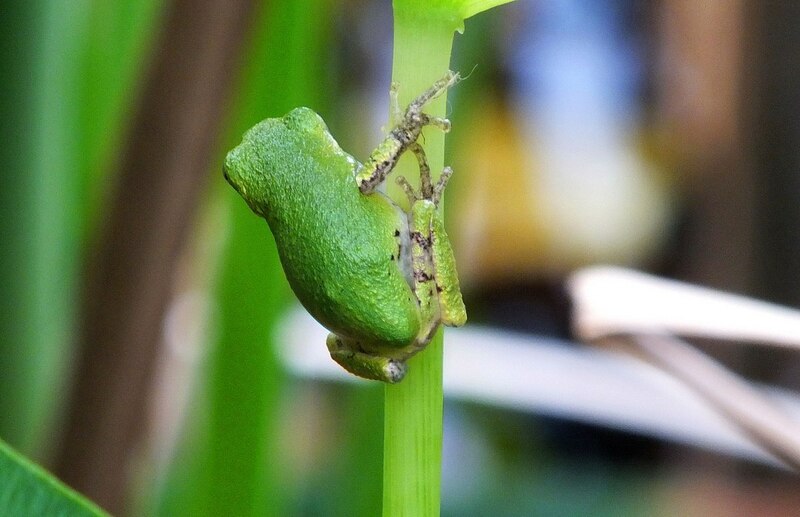 If we detect the “twang” of a banjo string or the “glunk” or a rubber band, it may indeed be a male Green Frog defending its territory against competitors.